For a girl whose lineage is mostly German, I don’t do much to represent my heritage. I know exactly ONE German word (duft blatt, which means “fragrant leaf” or “rose petal”) but only because it was the AIM screen name of one of my best friends from high school. I’ve never had schnitzel and refuse to eat sauerkraut. I don’t even drink beer, the carbonation (as with Pepsi and champagne and every punch ever served at a wedding or baby shower) making it completely unpalatable, despite my many attempts to choke it down. Which may help explain how I went nearly 29 years without attending an Oktoberfest. 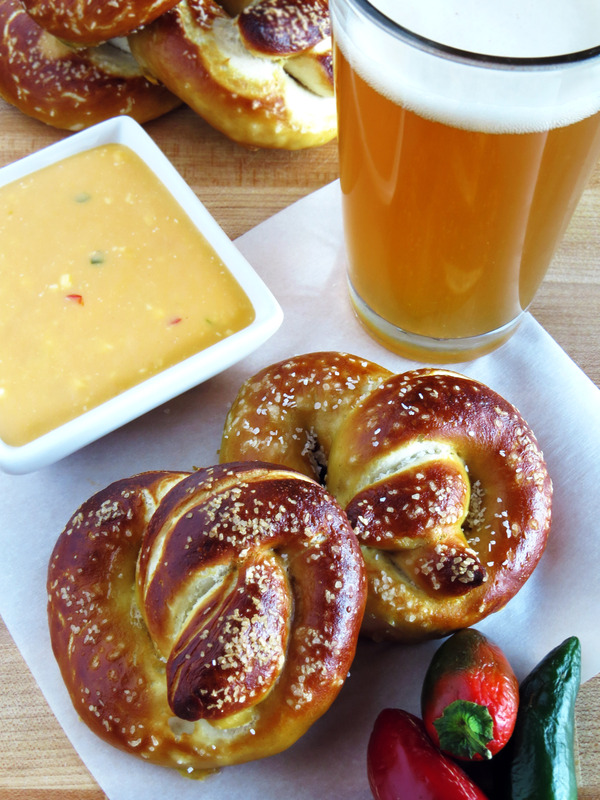 This version borrows elements from a previously successful pretzel recipe (found on allrecipes.com) and one from Food Network guru Alton Brown. My inner chemist is always delighted by the transformative powers of the baking soda bath; without it, these would simply be tough, inconveniently-shaped dinner rolls. Applying an egg wash just before baking gives these pretzels a lovely, glossy finish. Combine yeast and 1 teaspoon sugar in a medium bowl. Add 1 1/4 cup warm water and set aside for 10 minutes, or until foamy. Meanwhile, whisk together 3 1/2 cups flour, 1/2 cup sugar, and table salt in large bowl. Form a well in the middle of the flour mixture and add in vegetable oil and prepared yeast mixture. Stir with a wooden spoon until mostly combined. Turn onto floured surface and knead 7-8 minutes until dough is smooth and elastic, adding flour as needed to prevent sticking. Preheat oven to 450°. Add baking soda and 10 cups of water to a large pot and bring to a boil, then turn off heat. Turn the dough onto a clean, flat surface and divide into 12 equal pieces. Working one at a time, roll each piece of dough into a 18- to 24-inch long “snake” (you’ll probably have flashbacks to your Play-Doh days), then twist into a pretzel shape. * Dunk pretzels in baking soda water for 30 seconds each, then transfer to a baking sheet lined with parchment paper, spacing the pretzels 1- to 2-inches apart. Brush pretzels with egg wash and sprinkle with kosher salt. Bake 13-18 minutes, or until pretzels are a rich brown color. Serve immediately. *If you need a step-by-step tutorial for twisting, Canadian Living posted a great one on YouTube. 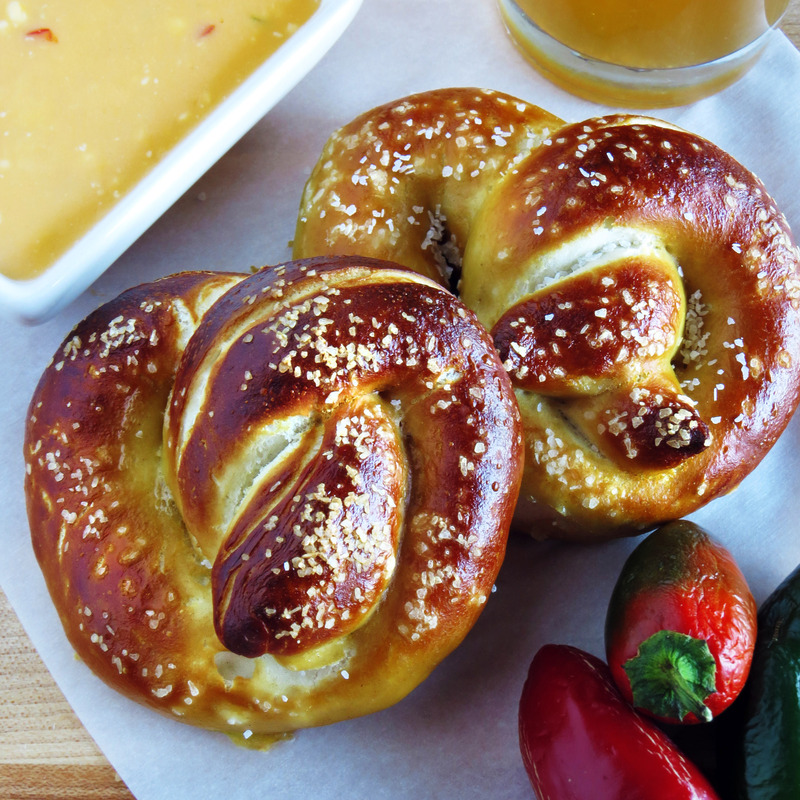 Adapted from The Noshery, which also features a recipe for mini pretzel hot dogs—yum! I used one large jalapeño (without the seeds or ribs) for a subtle heat; if you want to crank up the spiciness, use the entire pepper or mince a second. Melt butter in a non-stick saucepan over medium-high heat. Add garlic and peppers and cook 2-3 minutes, until fragrant and slightly softened. (I recommend that you keep your face away from the pan during this step; the jalapeño steam is potent!) Add the flour and stir with the vegetables and butter to form a roux. Pour in the beer and bring mixture to a simmer. Add cheddar and cream cheese to simmering beer. Once cheeses are melted, allow mixture to come slowly to a boil, stirring continuously. Boil 30 seconds then remove from heat. Cool for 3-5 minutes (it will thicken slightly) and stir before serving. If you’re making this ahead of time, put some plastic wrap on the surface of the beer cheese before storing in the fridge. Serve warm.